While Lhere Artepe remains tight-lipped about the Mt Johns development, an industry source says the subdivision is “at practical completion now”. It is entering the phase when service authorities – mostly the Power and Water Corporation and the Town Council – are carrying out final testing. The source says the services such as power, water, sewage, roads and drains are ultimately taken over by these authorities who then guarantee their adequacy. Once they are ticked off titles can be issued. The source says it is normal for some deficiencies to be discovered in this process: this was the case with Stirling Heights and the Golf Course Estate, for example. These deficiencies are fixed prior to the issue of titles. LAE Nominees Pty Ltd – an entity linked to the native title organisation Lhere Artepe – is the majority shareholder in the now defunct CDE Civil Pty Ltd, as well as the holder of the development lease, granted by the government, at Mt Johns Valley. They are two separate entities. Meanwhile the CDE Civil website, alive earlier this week, comes up with the message “account suspended”. CDE Civil Pty Ltd, which is linked to the Native Title organisation Lhere Artepe, owed $2.5m to 56 creditors when it was put into liquidation on Friday last week. Alice Springs News Online learned this from a reliable source today. 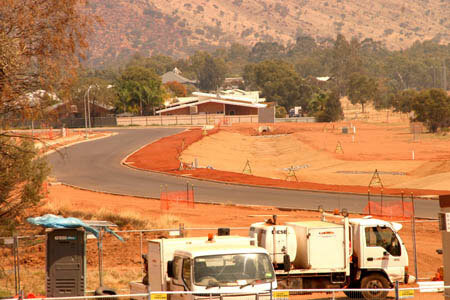 The company was involved in the still unfinished Mt Johns residential estate which followed a native title deal between the NT Government and Lhere Artepe. According to our source, the list of creditors is headed by the Tax Department ($1.6m), a pipe laying company, a plumber and an electrician. A local clinic is owed $200. The group seeking to reform the native title organisation Lhere Artepe says it is investigating whether native title land was used as collateral for borrowings by CDE Civil Pty Ltd which was put into liquidation last week. This may include blocks in the still unfinished residential subdivision in Mt Johns Valley (see also reader’s comment). 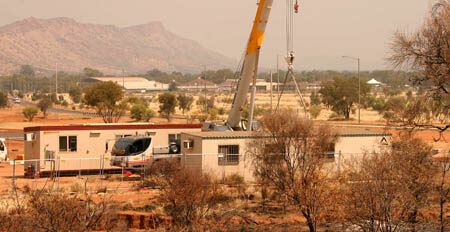 The largest shareholder of the company is LAE Nominees Pty Ltd which nominates its principal place of business as 21 Leichhardt Terrace, Alice Springs, also the office of the prescribed body corporate of the native title holders, Lhere Artepe Aboriginal Corporation, at least until recently. One of the reform group’s spokespersons, Ian Conway, owner of King’s Creek Station and a prominent native title holder, says another source of collateral may be supermarkets bought by a company in the Lhere Artepe Group for $14m, including a grant of $6m from the Federal Government. Darryl Pearce, the former CEO of Lhere Artepe, and the only director of CDE Civil, has not responded to requests for comment and information from Alice Springs News Online, and neither have the liquidators. Mr Conway says unravelling a complex network of proprietary limited companies will be a main task for the reformers. Other Aboriginal leaders backing the move include Harold Furber. Mr Furber said when Alice Springs News Online asked him to comment: “Sadly there will be a huge fall-out. “This will have a major effect on the community. There appear to have been problems at Lhere Artepe for a number of years. “I fully back the so-colled dissidents, such as Connie Craig, who have been raising issues of governenace of Lhere Artepe for a number of years,” Mr Furber said. Both Mr Conway and Mr Furber agree that the structure and decision making should be through the proper body Lhere Artepe Aboriginal Corporation, set up to hold the native title rights in trust pursuant to a decision by the Federal Court and incorporated by the Office of the Registrar of Indigenous Corporations (ORIC). Mr Conway says control of these affairs must rest with the people who have power under traditional structures, including the “relevant Apmereke-artweye and Kwertengerle” for each of the three estate groups in Alice Springs. Photos: Part of the unfinished Mt Johns Valley subdivision, and a site office being removed from it yesterday. The News has requested information from the hiring company, Ausco Hire, and will report it when it comes to hand.